Aurora St. Luke’s Medical Center is a 650-bed, tertiary hospital located in Milwaukee, WI. Its specialties include cardiac services, neurology, and oncology. Due to its complex and highly acute patient population, St. Luke’s has 125 beds on six intensive care units (ICUs). Portable x-rays play a key role in diagnosing and monitoring these patients. Every morning, two teams of two radiologic technologists make their rounds in the ICU, collecting between 40 and 70 portable x-rays. A 2002 study conducted at the Mayo Clinic in Rochester, MN, and published in Radiology Management in 2004 concluded that the task of performing portable chest x-ray procedures puts staff members at risk for injury of their shoulders and upper torsos. The study recommended further research into safer techniques and devices, as incidents have been reported, yet no associated published research was identified to offer advice on the topic of portable x-ray ergonomics. The following offers such advice and describes St. Luke’s efforts to find a better way to perform portable x-rays. Case Study At a Glance . . .
-Radiologic technicians at Aurora St. Luke’s Medical Center in Milwaukee, WI, were experiencing injuries at an alarming rate, resulting in more than $200,000 in workers’ compensation and lost productivity costs. -Lean methodologies were used to evaluate the situation, identify areas of opportunity, modify the existing process, substantiate and enumerate improvements, and implement new standard work. -A cross-functional team conducted experimental research to test several variables and methods. The resulting new ergonomically sound procedure has eliminated injuries associated with performing portable x-rays. Download the entire case study (PDF) or continue reading below. Visit the Learn About Quality and Quality Tools A to Z pages to learn about dozens of topics in the world of quality. 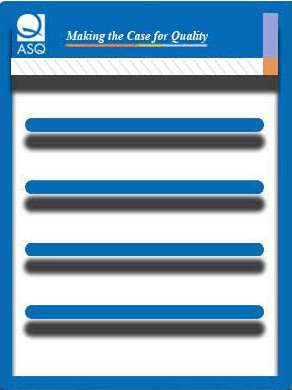 The ASQ case study collection contains more than 1,700 examples of quality solutions to real-world problems. Find more case studies in healthcare to learn how hospital officials and others in the industry are using quality to improve processes and reduce risk while helping patients. St. Luke’s diagnostic radiology department had been working with a risk management consultant for several years in an attempt to solve the problem of technician injuries. A thorough analysis of the portable x-ray process concluded that the root cause for injuries was ergonomically unsound lifting practices. 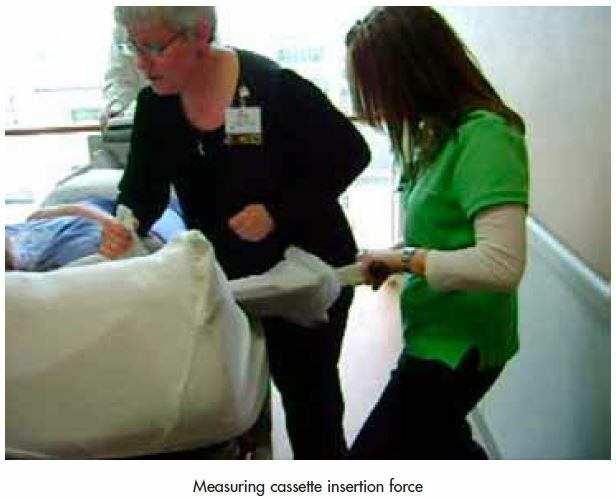 The photo on page 2 shows that caregivers were lifting the patient with one arm (grabbing the bed sheet) while reaching up and out to place the cassette behind the patient’s back. The x-ray cassettes weigh approximately 10 pounds each. Reaching 25 inches places 250 pounds of force on the shoulder. After contacting several area hospital systems, St. Luke’s discovered that others were experiencing injuries related to the portable x-ray process, but no one had found an effective solution. The occupational health department at St. Luke’s had suggested several interventions. Some were tried, but implementation was unsuccessful. Consequently, occupational health and diagnostic radiology leaders elected to try a different approach. Aurora had been using lean methodologies to solve problems and improve processes in other areas of the business. The medical director of occupational health, the safe lifting program coordinator, the lead diagnostic technologist, and the manager of operations improvement organized a formal lean event. Team composition is critical in any change initiative. One of the key reasons for the failure of past interventions was that nursing support was needed to make the changes work; therefore, nursing representation on the lean team was ensured. The team also made sure to follow a key lean principle: involve front-line employees. Ultimately, the dynamic cross-functional team consisted of radiologic technologists that did the job every day, two ICU nurses, representatives from occupational health, and lean facilitators to guide the team through the process. In addition to reviewing workers’ compensation and lost work time data, the team surveyed technologists to establish a baseline for the amount of pain and discomfort experienced before and after their shifts. Using a scale where 0 represents no pain or discomfort and 5 indicates severe pain, technologists rated the degree of soreness, pain, stiffness, and loss of motion or loss of strength that they experienced before and after completing their shifts. 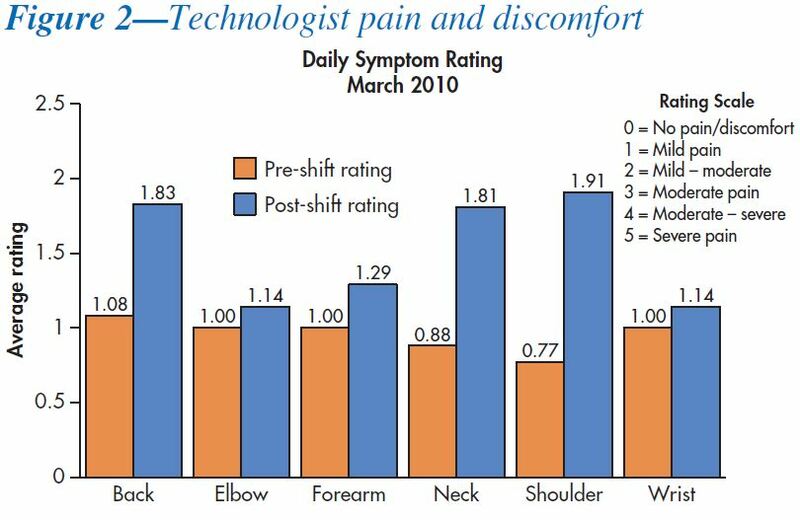 Figure 2 summarizes the average ratings of 12 technologists, showing that they were experiencing mild pain at the start of their shifts and that they experienced more pain and discomfort in their shoulders, necks, and backs after completing their shifts. Next, a detailed process map was created showing the steps taken by the technologists to acquire portable x-rays in the ICU in the morning. The process started when a technologist first arrived in the morning and ended with the last x-ray taken for the ICU patients. The specific steps at which caregivers sustained injuries were identified. 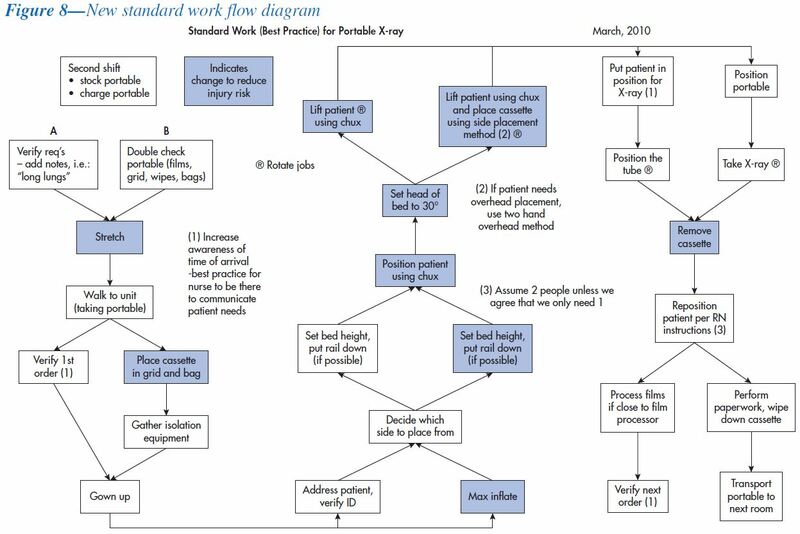 The process map in Figure 3 illustrates that efforts needed to focus on finding better ways to position and reposition the patients and to insert and remove the cassettes. The fishbone diagram in Figure 4 helped capture the various factors that could contribute to injuries. As the fishbone diagram shows, many different combinations of materials, equipment, and methods were employed every day, and some variations contributed to the poor ergonomic practices that were leading to injuries. The team designed an experiment to test different combinations of materials, equipment, and methods in an attempt to isolate the best combination. Figure 5 shows the variables included in the research. For all variables except max inflate and mattress surface, option 1 represents existing practice. Patient angle refers to the angle at which the patient is sitting. 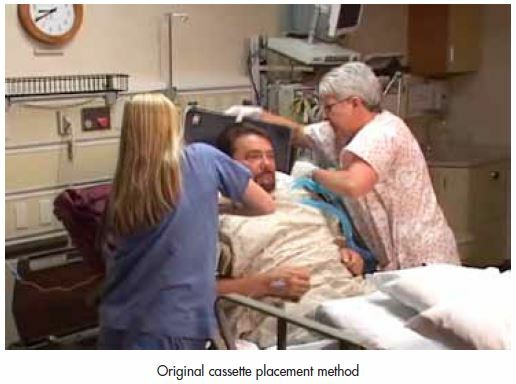 Existing practice was to have the patient sit up as much as possible (close to 50 degrees) when placing the cassette behind the patient. 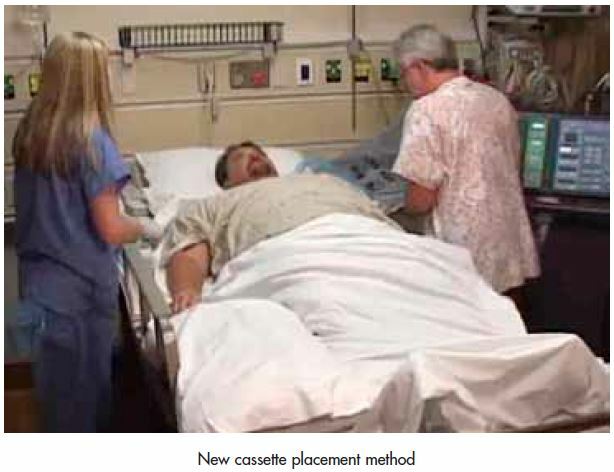 An alternative thought was to have the patient only slightly elevated (20 degrees) during cassette placement. One of the team members suggested placing the cassette from the side as opposed to the existing practice of reaching over the top. This way, the caregiver could rest the cassette on the bed and slide it instead of reaching up and out with the 10-pound cassette. A variety of mattress surfaces were in use throughout the hospital. Some surfaces were rubbery and sticky while others were made of slick synthetic fabric. Cassettes tend to slide easier on the slick surface, whereas they get stuck on the sticky material. One of the team members suggested placing the cassette in a plastic bag prior to placing it behind the patient, thinking that the plastic bag would provide a low friction surface that would be easy to slide. Some mattresses were air filled. If under-inflated, the mattress would have low spots or pockets where the cassette could become lodged. Air mattresses were equipped with a feature called “max inflate” which fills the mattress with air, eliminating the pockets, making the mattress surface hard and smooth. The existing practice was to lift the patient by “undoing” the fitted mattress sheet and using the sheet as a lifting handle. This did not work very well because the sheets were made of a jersey material that stretched easily. An alternative practice was to place a 3' x 4' washable pad called a “chux” behind the patient, one inch above the shoulder, prior to lifting. The objective of the research was to find the combination of variables that would minimize the amount of effort required to lift the patient, insert the cassette, remove the cassette, and reposition the patient. Simultaneously, the team wanted to find ways to make the portable x-ray experience more comfortable for the patient. Forces required to insert and remove the cassette were measured with a strain gage. The technologist was also asked to rate the amount of perceived effort required to lift the patient, using a scale patterned after the Borg RPE scale for perceived exertion. One of the team members assumed the role of the patient during the experiment. After each experimental round, the “patient” was asked to rate the degree of discomfort associated with the iteration. Eight iterations of the experiment were conducted testing the combinations shown in Figure 6. 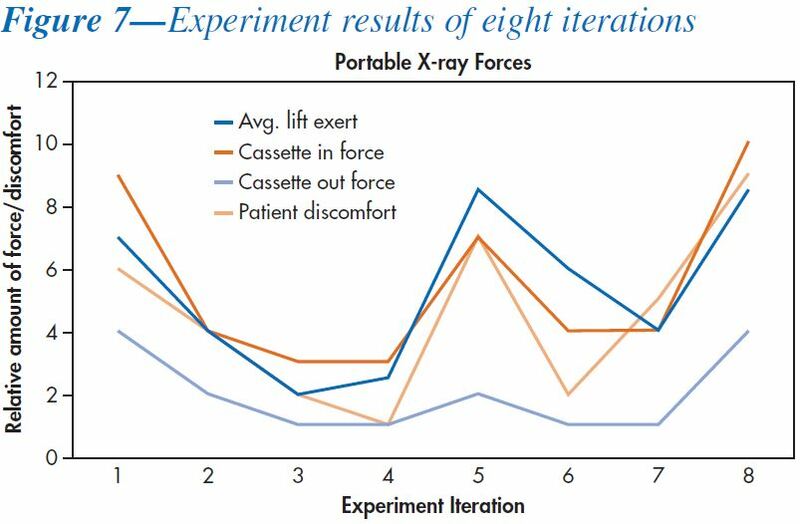 Figure 7 shows the results for each iteration in terms of the measured forces to insert and remove the cassette, the perceived effort to lift the patient, and the perceived level of discomfort for the patient. Of the eight combinations studied, iteration four yielded the best combination from the perspective of both the patient and the caregiver. The team concluded that the best practice would be to place the cassette into a plastic bag and insert it from the side while the patient was laying at 30 degrees. The mattress should be fully inflated and the patient should be lifted using the chux. With the addition of the chux, the fitted jersey sheet remained in place and the plastic bag slid between the chux and the sheet. The underlying mattress surface was no longer a factor. The team developed a new standard work flow that incorporated the knowledge gained from the experiment. In addition, a stretching regimen was developed for the start of the day. Figure 8 shows the new procedure, detailing how a two-person team (tech A and B) should work together at each step. Changes designed to reduce injuries are highlighted. The new practice requires that the chux be placed under the patient’s back prior to the arrival of the portable x-ray crew for its morning rounds. Team members met with nursing unit managers and clinical nursing specialists to gain their support and determine the best way to make this happen. ICU patients need to be turned every two hours to reduce the risk of hospital acquired pressure ulcers. Consequently, the ICU managers agreed to have nurses place a chux behind patients during a routine turning. The next step in implementing the new practice was to have the frontline nurses and radiology technologists from the lean team attend ICU staff meetings to provide the background regarding why nurses were being asked to change their practices. In the meantime, the radiology technologists were being trained on the new procedure and stretching exercises. The new procedures were implemented in April 2010. At the time of this writing, Aurora St. Luke’s Medical Center has gone 11 consecutive months without incurring a radiologic technologist injury. 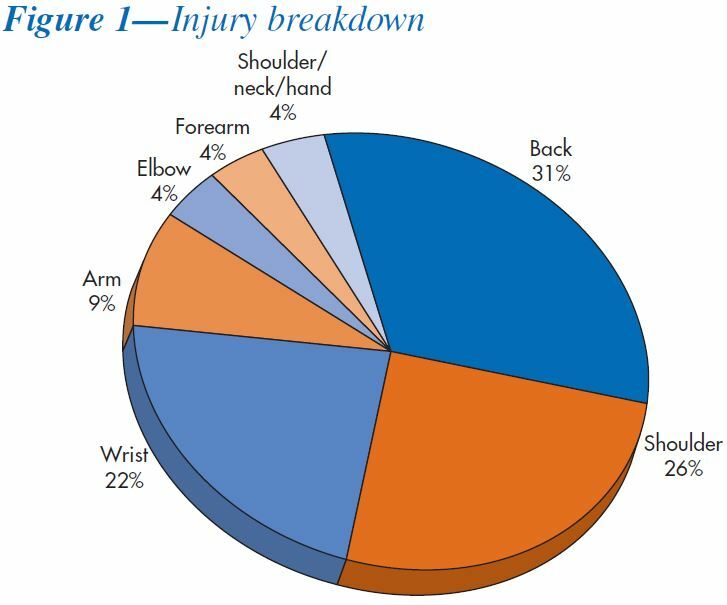 Previously, the average had been nearly one injury a month. The “aches and pains” survey was duplicated in September 2010. 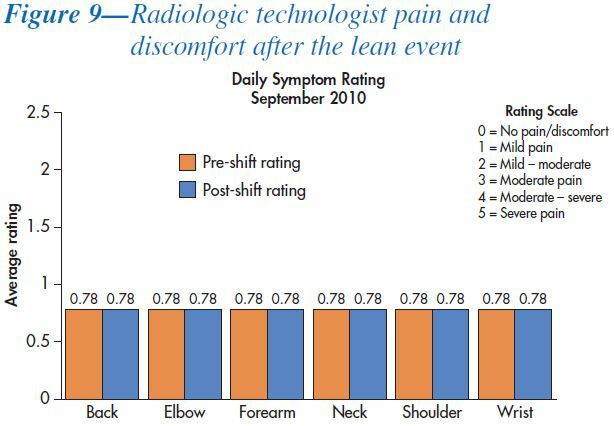 Radiologic technologists reported starting the day with a lower level of discomfort that was not increasing during the day. Figure 9 shows these results. St. Luke’s is also on track to save more than $200,000 per year from reductions in workers’ compensation and lost work days, as well as improved productivity. Diagnostic radiology productivity over the past three months was 14 percent higher than pre-event levels, in part because there are no longer technologists working on light duty who are unable to work on portable crews. Another factor contributing to improved productivity is that prior to the adoption of the new practice, teams would often work at a slower pace because one or both team members were experiencing shoulder, neck, or back pain or discomfort. Diagnostic radiology is now in the process of making the new process “standard work” or a “best practice” for the organization. A training video is being created that will be used with new employees and shared with other Aurora facilities. Learn more about Aurora St. Luke’s Medical Center by visiting the Aurora Health Care website at www.aurorahealthcare.org. Read the Mayo Clinic study about the injury risks associated with performing portable chest x-ray procedures. See E. Meittunen, K. Graham, and D. Spence, “Evaluation of a Hidden Occupational Healthcare Risk: The Portable X-ray,” Radiology Management 26, no. 6 (2004): 44-53. Learn about the Borg RPE scale for perceived exertion n G. Borg, Borg’s Perceived Exertion and Pain Scales Champaign, IL: Human Kinetics, 1998). To view this and other case studies, visit the ASQ Knowledge Center’s Case Studies landing page at asq.org/knowledge-center/case-studies. Robert Loose is an ASQ Certified Six Sigma Black Belt and Certified Manager of Quality/Organizational Excellence who holds a bachelor's degree in industrial engineering. After a 20-year career in manufacturing, Loose joined Aurora in 2008 as operations improvement manager, where he is using Lean Six Sigma concepts to find better ways to deliver healthcare. This article first appeared in the January/February 2011 edition of Radiology Management and is used by ASQ with permission of AHRA, the Association for Medical Imaging Management.